(CNN) -- The New York Times has rejected an essay that Sen. John McCain wrote defending his Iraq war policy. Sen. John McCain wrote an op-ed for The New York Times, but the paper said it could not publish it as written. In an e-mail to the McCain campaign, Opinion Page Editor David Shipley said he could not accept the piece as written, but would be "pleased, though, to look at another draft." In a statement released Monday, The New York Times said it is "standard procedure on our Op-Ed page, and that of other newspapers, to go back and forth with an author on his or her submission." "We look forward to publishing Senator McCain's views in our paper just as we have in the past. We have published at least seven Op-Ed pieces by Senator McCain since 1996. 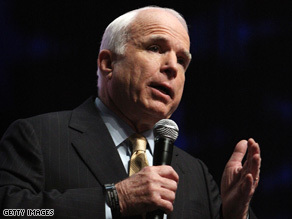 The New York Times endorsed Senator McCain as the Republican candidate in the presidential primaries. We take his views very seriously," the statement said. McCain's rejected op-ed was a lengthy critique of Obama's positions on Iraq policy, particularly his view of the surge. Obama's July 14 essay had taken shots at McCain for not further encouraging the Iraqi government to take control of the country. "Instead of seizing the moment and encouraging Iraqis to step up, the Bush administration and Senator McCain are refusing to embrace this transition -- despite their previous commitments to respect the will of Iraq's sovereign government," Obama wrote in his op-ed. Shipley, who was President Bill Clinton's senior speechwriter from 1995 to 1997, had advised the McCain campaign that "the article would have to articulate, in concrete terms, how Senator McCain defines victory in Iraq. "It would also have to lay out a clear plan for achieving victory -- with troops levels, timetables and measures for compelling the Iraqis to cooperate. And it would need to describe the senator's Afghanistan strategy, spelling out how it meshes with his Iraq plan." He added that he hoped the parties could "find a way to bring this to a happy resolution." McCain spokesman Tucker Bounds said Monday the Arizona senator's position will not change based on the "demands of the New York Times." "John McCain believes that victory in Iraq must be based on conditions on the ground, not arbitrary timetables," he said. "Unlike Barack Obama, that position will not change based on politics or the demands of the New York Times." The newspaper endorsed McCain for the Republican presidential nomination in January, shortly before the New York primary. In February, after it became clear McCain would be his party's presumptive nominee, the paper published a thinly sourced report that McCain once had a close relationship with a female lobbyist. McCain said he was disappointed in the New York Times piece. The paper said that it stood by its reporting and that "the story speaks for itself." McCain's campaign sent out fundraising appeals based on the article. The article "is particularly disgusting -- an un-sourced hit-and-run smear campaign designed to distract from the issues at stake in this election," McCain's campaign manager, Rick Davis, wrote in a e-mail to supporters. "We need your help to counteract the liberal establishment and fight back against the New York Times by making an immediate contribution today," the e-mail said in text that linked to an online contribution form on the McCain campaign's Web site.